To have an item listed please email as detailed information as possible. Best for Ages 4-7. Bought from the well-known Scoggins and Scoggins Violins who made careful tune-ups, a custom shaped bridge, and put on high quality strings. 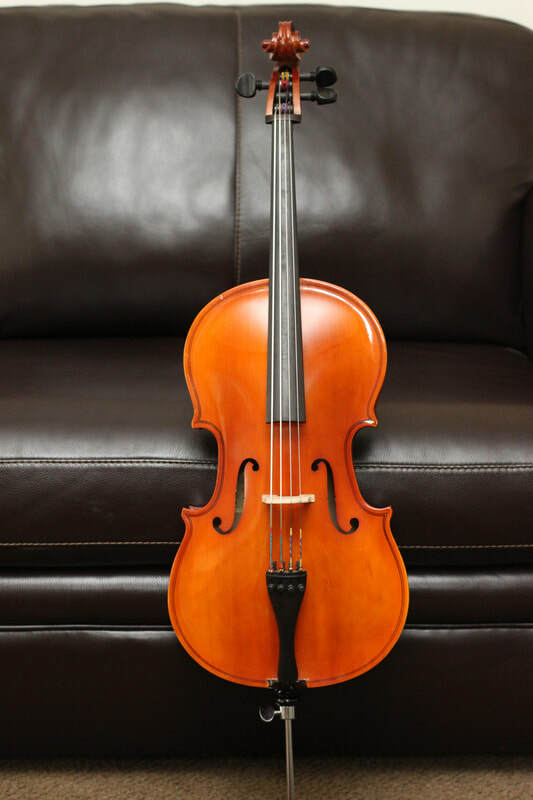 Cello body length (without end pin or neck/fingerboard) is 18"; body length with scroll is 30"; 18" bow; practice peg with turn key; comes with a soft case. My son started on this cello at 4 1/2--he's slightly below average height, and we needed the next size once he was 7). Some wear on fingerboard where practice tapes have been on and off. Fantastic sound--far superior to any 1/10 cello in our Suzuki studio. I'm sad to see it go, but he will be our only cellist. Coda carbon fiber bow. Umbrella case (hybrd hard/soft). Rock stop. Cello stand. This cello carries a beautiful rich sound. $4000. I love it and would keep it but right now I need other things more. I currently live in Bountiful. I am in nursing school at Weber State and work part time so leave a message or text. hand-applied antique varnish, African Ebony fingerboard and stellar ebony fittings. (priced at $1595) and we all thought it sounded better. Includes a soft case and a bow. Call or text Ellen Burns 801-763-8528 to come try it out! A student cello: Peccard Model C-8 Size 4/4 Copy of Antonion Stradevarius ANNE 2003 West Coast String Instruments.